What is a provisioning file? This workflow is for software license administrators or software users who are authorizing ArcGIS Pro licenses with a provisioning file. This topic describes the workflow for authorizing a Single Use license, but it is essentially the same for a Concurrent Use license. Provisioning files are not used with Named User licenses. A provisioning file is a plain text file that automatically supplies required information—such as product name, authorization number, and user contact information—to the Software Authorization Wizard. This is convenient when multiple licenses are being authorized because it isn't necessary for each user to enter the information manually. A provisioning file is especially useful for an organization with many Single Use licenses. In this case, a single provisioning file can be used to authorize the software on multiple machines. Provisioning files for Single Use licenses have the file extension .prvc (denoting a client provisioning file). Provisioning files for Concurrent Use licenses have the file extension .prvs (denoting a server provisioning file). After converting Named User licenses to Single Use or converting Named User licenses to Concurrent Use, a software license administrator can create a provisioning file. Under the My Organizations tab, click the Licensing tab. In the list of side tabs, click Create Provisioning File. In Step 1: Select Provisioning Options, under Product Type, specify the product type, version, and license type for which you want to create the provisioning file. Under Provision, specify whether you want to include the core product and extensions, the core product only, or extensions only. Under File Type, confirm that Provisioning File is selected. 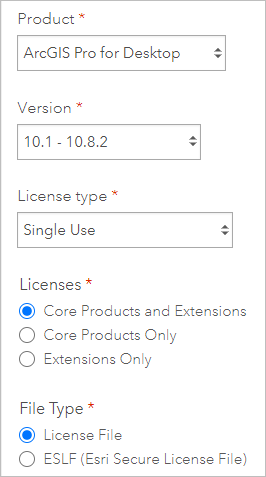 In Step 2: Select Products, in the Allocate column, select the check box for the appropriate license level. In this example, the provisioning file is being created for ArcGIS Pro Advanced licenses. If the provisioning file is for Concurrent Use licenses, you have the option to specify the number of licenses that will be allocated in the provisioning file. In Step 4: End User Information, fill out the required fields of contact information. In Step 5: Delivery Method, specify whether you want to download the provisioning file or receive it by email. In this example, the file will be downloaded. In Step 6: Review Provisioning File, confirm that the information is correct. At the bottom of the page, the quantity is 1. This means that one authorization number will be generated in the provisioning file. This number can be used to authorize all available ArcGIS Pro Advanced licenses (30 in this example). A message confirms that the provisioning allocation was successful. The provisioning file, with a name like ArcGISProAdvanced_SingleUse_XXXXXX.prvc, is downloaded to your default download folder. You can now use the provisioning file to authorize ArcGIS Pro. You may want to move it to a network location where it is accessible to other users. Begin the authorization process as described in Authorize and start ArcGIS Pro with a Single Use license or Authorize ArcGIS Pro with Concurrent Use licenses. In the Software Authorization Wizard, on the Authorization Options page, the default option is to authorize the software using the Internet. If you have a provisioning file, choose the option to use an authorization file as described in the following steps. In the Software Authorization Wizard, on the Authorization Options page, click I have received an authorization file and am now ready to finish the authorizaton process. Click Browse and browse to the location of the provisioning file. On the Open Authorization File dialog box, click the provisioning file to select it and click Open. The provisioning file appears in the text box on the Authorization Options page. The provisioning file has the extension .prvc for Single Use licenses or .prvs for Concurrent Use licenses. On the Authorization Method page, choose the authorization method you want to use and click Next. The recommended method is to authorize with Esri using the Internet. If an Internet connection is not available, see Authorization files. On the Authorization Information page, the required information is supplied by the provisioning file. Click Next. On the Authorization Information (continued) page, fill in the required information and click Next. On the Software Authorization Number page, the authorization number is supplied by the provisioning file. Click Next. On the Authorize Software Extensions page, accept the default option not to authorize extensions and click Next. If your provisioning file includes authorizations for extensions, the option to authorize extensions will be selected and authorization numbers will appear next to the extensions. When the process finishes, a message on the Software Authorization Wizard confirms that your software has been authorized and is ready for use. On the ArcGIS Pro Licensing dialog box, click OK.